2Flyer Screensaver Builder is the fastest and most powerful tool which lets you make your own screen saver or slide show presentations; you can use pictures, music, flash, video, or even online information. Try it and have fun today! Free Trial Download Buy Now! 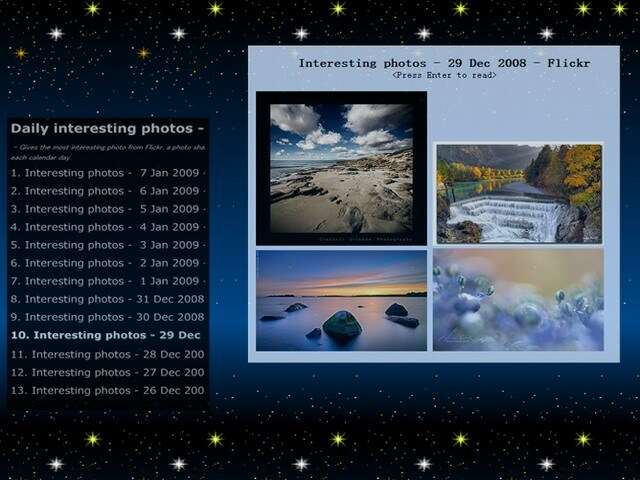 New features: Display live content from Internet in screensaver, includes daily updated photos, RSS news, online flash, video, applets or even live web sites. Create Windows 98/ME/2000/XP/Vista/7 compatible screensavers; supports Multiple Monitors. Collect up to 10,000 images (JPG, GIF, BMP or PNG, TIF, SGI...) and 2flyer will merge them into a screen saver. Add sound and music files (MP3, WMA, WAV, MID; and even Internet Radio) as an aural background to your screensavers. Display images from 290 images transition effects that can be customized to create unlimited unique effects. Create a single .scr or .exe screensaver installation file - email and share the screensaver with your friends at any time. "The Best Screensaver Maker On The Net!" This is an incredibly easy to use software. Within 10 minutes of first opening it, I had myself a fairly elaborate screen saver completed ... It just can't be any easier. Get this. You'll love it. Thank you from the bottom of my 56 year old heart for writing and distributing such a professional program. I have had SO MUCH enjoyment this past week building screensaver after screensaver. it will remain ALWAYS as one of my very favorite programs. Play Flash & Flash MX files or online Flash resources in screensaver software. Play movie clips in screensavers, make YouTube screensaver, Google Video screensaver; supports RealPlayer, MediaPlayer or QuickTime files (RM, RA, RMJ, RAM, RMM; MPG, MPEG, MPE, MOV; ASX, ASF, WMV, AVI); You can even play online channels (Audio or WebTV). Play web pages in screensavers, supports java applet screensaver; complete with offline mode, display interval setting and other features. Create customized screensaver icon, quick installation and more. Create unlockable "Try & Buy" screen savers with registration code; trial day limit; media files limits; sales information dialog, etc. Provides extra functionality of special interest to commercial users, make the distribution of advertising and royalty based screensavers a breeze! Download and play the most popular YouTube videos as screensaver, a smart YouTube player embedded. You can browse the most viewed, most discussed, top rated and all recently added videos directly in a cute window; supports loop, HD video format, search, window stay on top properties; the video size in screensaver could be original, double size and full screen mode. Reading news, blogs in screensaver gracefully. This is the only screensaver that shows floating RSS headlines and articles in ORIGINAL format with image. It's got some pretty configuration settings as well. You can set RSS reading interval, background photos, use up/down arrow keys to navigate between feed items, spacebar to pause scrolling, enter key to open in browser. Supports all major feed formats, including RSS, Atom and RDF.